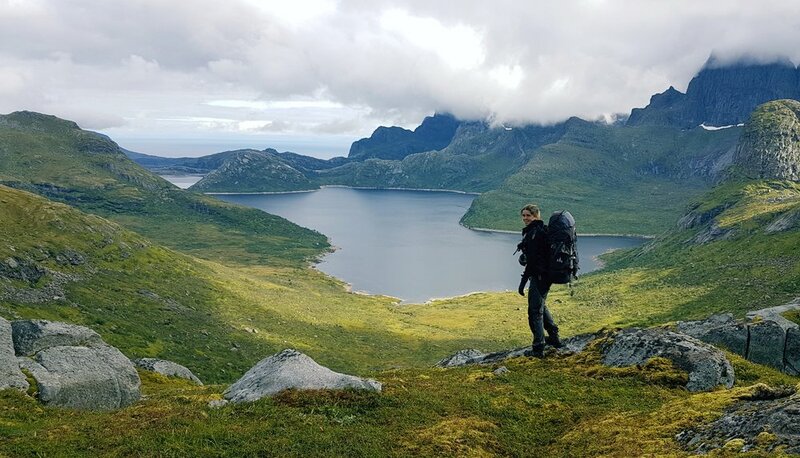 It was my birthday and day zero of my “Crossing an Arctic Archipelago” adventure, in which a friend and I were aiming to trek 150 km across the Lofoten islands in arctic Norway. Self-supported, we would be wild camping every night and carrying all our equipment and food for the full eight days we’d given ourselves. We knew it was ambitious, but we were up for a challenge and had both been preparing for some time. However, it is an unfortunate fact of life that sometimes things don’t go to plan, and this was the case for us. After an eventful day of luggage temporarily lost by the airline, connections missed and the only ferry for several days to our start point leaving without us, we had to accept that our original adventure was well and truly out of the window. Having established that, it was then a matter of working out a Plan B. We quickly figured out that a ferry was running to the southern end of the islands the following day at 3am. Determined to at least make it over to Lofoten but with nowhere to stay while we waited, we made our way to the ferry terminal and attempted to make ourselves comfortable for the night. This was easier said than done; it was a cold building with a hard stone floor and automatic doors that insisted on opening of their own accord all night. Still, I lay down on the floor and managed to get a few hours’ kip, under the watchful eye of a somewhat creepy homeless man who emerged periodically out of his apparent home in the disabled toilet. Far too soon it was time to get up for our ferry. Waving goodbye to our new pal, we stumbled onto the ferry in the darkness, promptly falling asleep again. 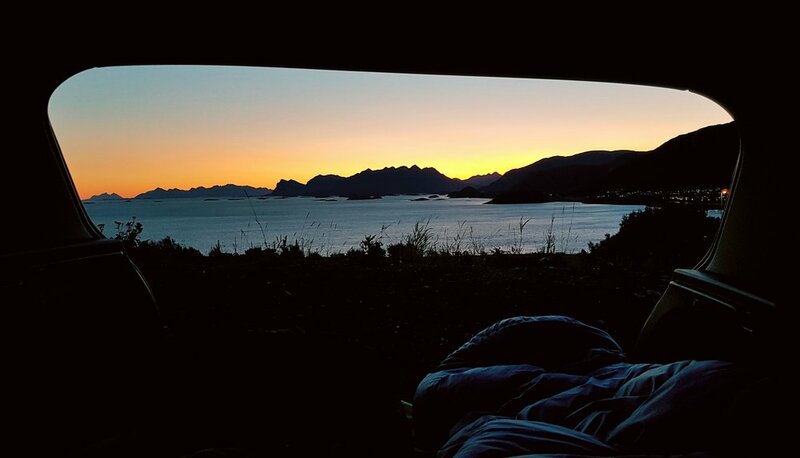 When I next awoke, the sky was light and in the distance, just visible, I could see Lofoten rising out of the water. My first impression of the archipelago on that cold, grey morning was that it looked intimidating and hostile: great jagged pinnacles of rock loomed up from the sea, patches of snow visible on some of the higher, inaccessible peaks. Any previous expectations I may have had of a clear blue ocean and white, sandy beaches that rivalled the mediterranean vanished instantly. In it’s place was one singular thought: what would the next week bring? Walking off the ferry in Lofoten, my anxieties were placated and the excited adventure buzz returned: we were surrounded by towering mountains and clusters of traditional wooden buildings, which were reflected almost perfectly in the mirror-like water of the fjord, the sun even breaking through the grey cloud from time to time. Arriving somewhere as remote and disconnected as this, with no real plans, itinerary or transport even, can be daunting. Though we had a vague idea of attempting a variation of our original trek in reverse, even at this early stage we were unsure of whether it was possible. First things first, however: there was a small passenger ferry with our names on it, waiting to take us to the top of the fjord where our adventure would begin in earnest. Speeding across the water, wind and rain showers whipping at our faces, we were awestruck by the dramatic landscape surrounding us. Sheer walls of impenetrable rock stood tall over the water, like formidable gatekeepers guarding the lands beyond, crowned with wreaths of grey cloud. 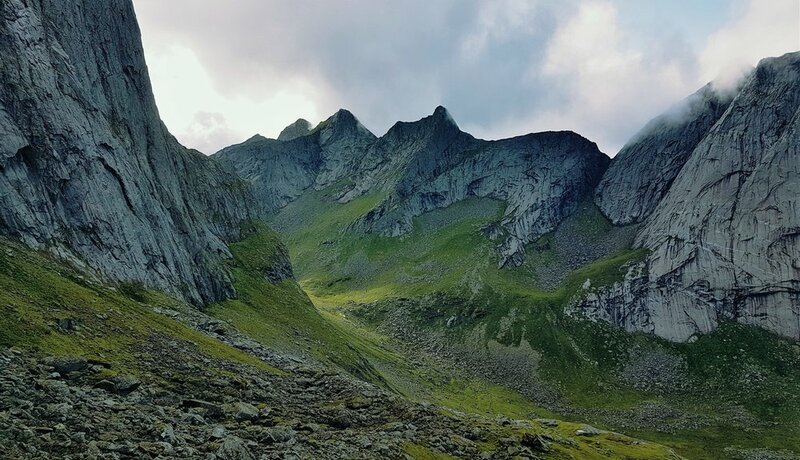 It was now time to crack on with some trekking: heaving our heavy rucksacks onto our backs, we set off up a relatively gentle slope taking us between two less-gentle mountains. The long slog eventually complete, we were rewarded with a spectacular view down to a distant beach, its white sand easily distinguishable against the dark grey of the mountains and sea encompassing it. Knowing how many more miles we needed to cover that day, we permitted ourselves only a short break before continuing. The next section proved demanding though enjoyable, as anyone who shares my love for trekking in the mountains will be able to appreciate. The route was so steep that at times I had to pull myself up or scramble on all fours. Looking ahead to assess the easiest route meant stopping frequently, though I was certainly glad of the breathers and opportunity to gulp down a few mouthfuls of water. Reaching the highest point of the pass, we discovered that in that short ascent we were now on a par with some of those snowy patches I’d spotted from our ferry much earlier that day. The vista that unfolded before us was breathtaking: in all directions, abrupt mountains rose and fell, expansive lakes or the distant sea visible below. Now a new challenge arose: a quick test of our map reading skills showed that our route would take us down a perilously steep mountainside. Under typical conditions this would have been tough enough, however recent heavy rainfall had eradicated any discernible path and every step took our utmost concentration to ensure we stayed upright. We had somewhat naively anticipated that our progress would be able to now speed up, given that the route descended and levelled out for the majority of the day’s remainder. Unfortunately it rapidly became evident that we had a long and frustrating afternoon ahead of us. 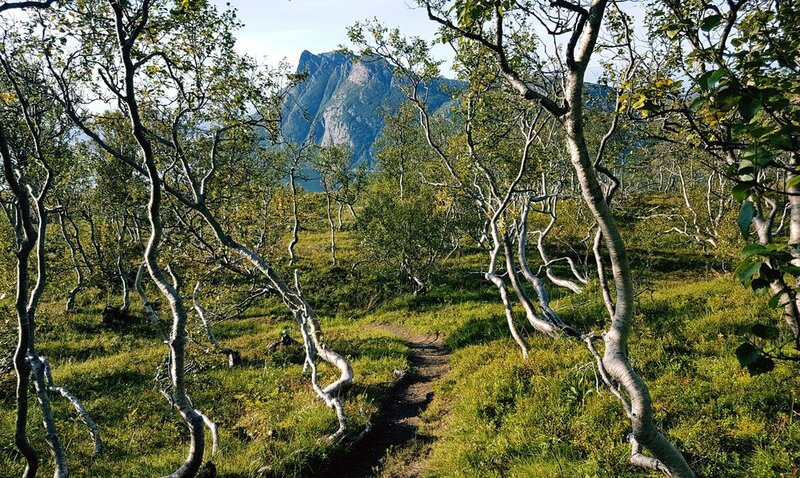 Eventually reaching the bottom of the slope, we were greeted with dense, spiky bushes and deep boggy ground, the only break from which came in the form of huge, slippery boulders we were forced to clamber over. After battling through for what felt like eternity, we finally emerged the other side and found a sheltered spot to pitch the tent, our boots and trousers soaked from the knee-high wet grass of the last stretch. As the first portentous drops of rain fell, we crawled into the warmth of our sleeping bags, not caring that our distance had fallen significantly short of what we’d set out to accomplish that day. After the brutality of what we’d persevered through, all we wanted now was dinner and sleep. The following morning we woke late, allowing ourselves some extra recovery sleep. 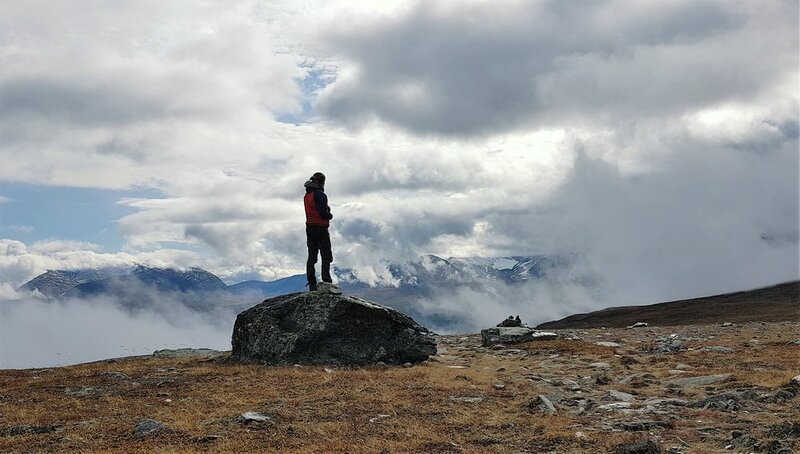 On the few occasions that I’d woken up during the night, I’d heard the rain hammering against the thin material of our tent and by morning, it showed no sign of letting up. By the time we forced ourselves into packing up our tent, it was midday and any remaining determination to trek for the next week had been washed away. 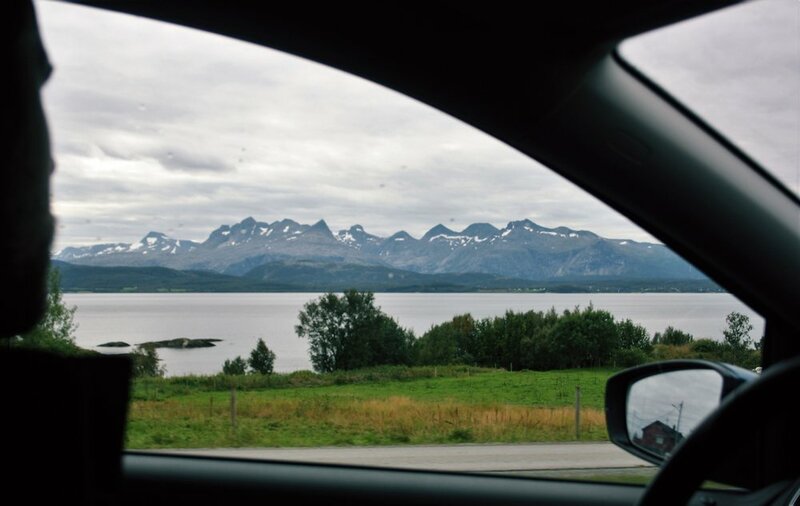 It is for that reason that when, thirty minutes later, a tiny, battered rental car pulled up beside us and the window was wound down to reveal a friendly American couple offering us a lift, we accepted without a moment’s hesitation. We had no interest in forcing ourselves into spending the remainder of our time here trekking in the rain, miserably trying to make up for lost time to get the distance covered… It was time to embrace the spontaneity of an entirely unplanned adventure. That first lift, though short and bumpy (the chap behind the wheel had never driven “stick shift”), started a trend for the next few days. No more than twenty minutes after waving goodbye to our new friends from across the pond and resuming on foot, another car stopped at our side. This time, it was two sisters from France extending a helping set of wheels. They drove well out of their way in order to drop us at a spot with much more promising hitch-hiking opportunities. After inhaling a hot dog from a nearby service station (a theme of the trip), we pitched up on the side of the road, thumbs extended and our most approachable and appealing smiles plastered across our faces. It didn’t take long for my signature roadside boogie, perfected a few years prior while hitchhiking to Morocco, to win over a driver. This time we really were in for a treat. 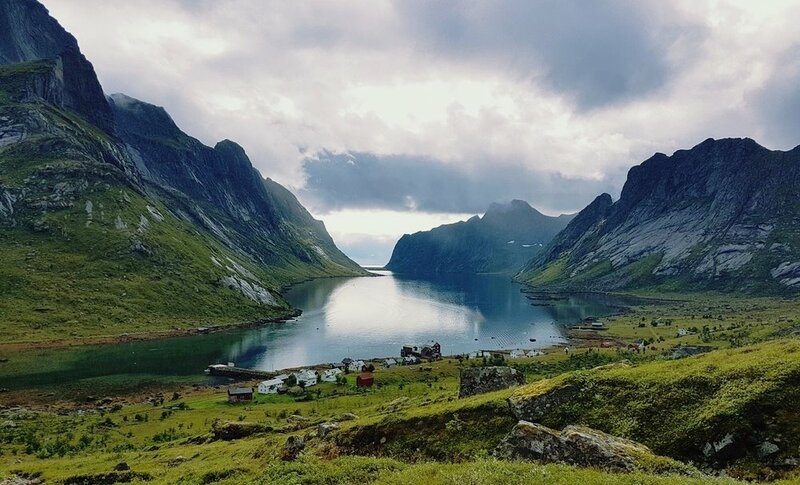 The large hire car was occupied by five sevenths of an utterly wonderful Spanish family on holiday in Lofoten, including their two youngest children aged eight and eleven. The two teenage girls had chosen to sit this particular evening drive out and were back at their cottage. As our only prerequisite was that we were heading north, we agreed to accompany the family on their short road-trip to a particularly beautiful fishing village. Arriving after an enjoyable car journey of chatting and getting to know each other, we were blown away when they invited us to stay for the night, offering a home cooked dinner and living room to sleep in. Honoured, we accepted their generous offer and, after exploring the dramatic coastline and letting their eleven year-old son (a budding young photographer) play around with my camera for a while, we returned to their idyllic, traditional wooden cottage. Their unquestioning hospitality and warmth is something that I will treasure for a long time. After a truly memorable time with the Spanish family, the unpredictability of our adventure continued. The following day we were driven 70 km further north by a refugee from Afghanistan who has called Norway his home for the last eight years. We had planned to then catch a ferry back to mainland Norway to continue our slightly random explorations, but once again the world had other plans for us: the forecast storms meant that all ferries for the remainder of the week were cancelled. We therefore settled on the next best option: a six hour coach journey. Once off the coach, we picked up the cheapest hire car we could find. It turned out luck was back on our side, as we collected keys for a brand-spanking-new car to play with for a few days. To make the most of the unlimited mileage, we decided to head across the border and into Sweden before returning the car. 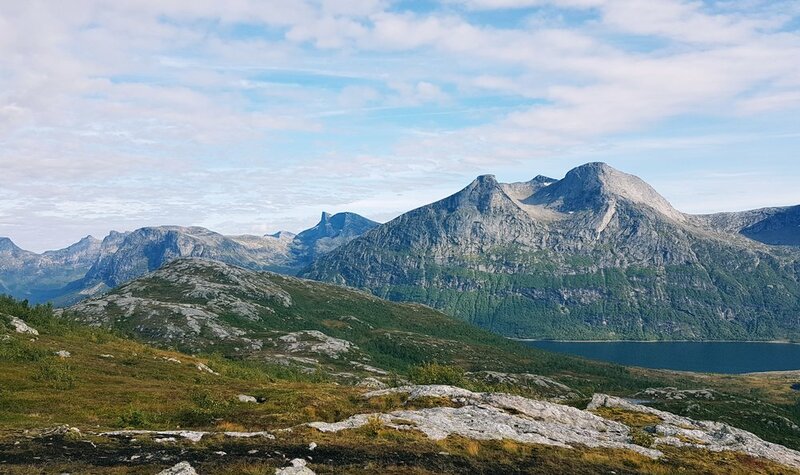 We spent hours traversing back-country roads in varying states of disrepair, taking in the seemingly endless forests, lakes and mountains, not to mention the reindeer who we sporadically shared the road with. In between the long hours on the road, we found a few small mountains to climb and some picturesque places to camp (in either the car or tent). On our last afternoon we finally experienced some truly stunning weather, which we enjoyed immensely as we made our way up a particularly beautiful mountain. 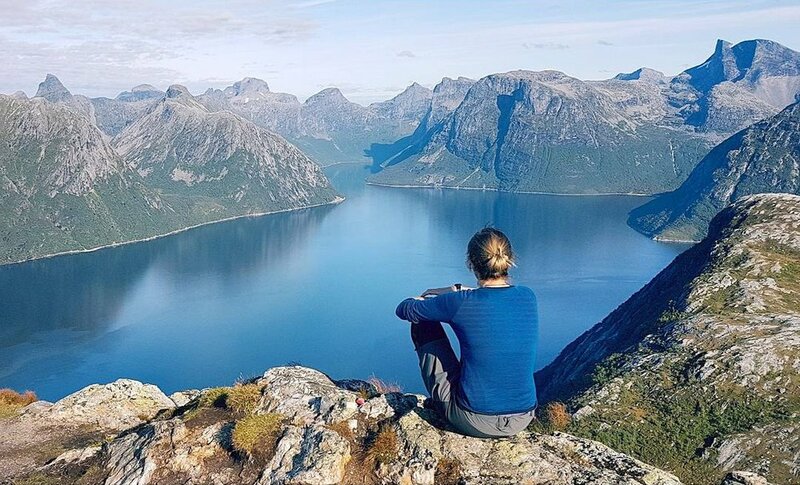 The views over the deep blue fjords and far-reaching peaks were certainly worth the climb, and for the first time I got a glimpse at what I’d envisaged the whole trip to be like. Later that evening, as the sun began to dip behind the mountains, we decided to really make the most of the clear sky and fading sunshine and go for a wild swim. The warm light of the evening sunshine illuminated the gentle ripples that dispersed around me as I waded in, the water just as cold and bracing as I had anticipated; perhaps it was this that made it so invigorating. Later that evening, from where we’d parked our car on a high viewpoint overlooking the darkening sea and mountains, we watched as the sun sunk below the watery horizon, casting its orange glow over the ocean in farewell. Reflecting back on the adventure we had come here to complete, and the one we had ended up experiencing, made me realise something: whether or not you accomplish what you initially set out to, it’s what you make of the journey, the misadventures and people you couldn’t have predicted meeting, that will stay with you. The easy option would have been to give up and go home at the first sign of things falling apart but, had we done that, we would have missed out on the many memorable experiences and moments that made up the adventure. Our persistence and openness to seeing what may happen next paid off and in return we were rewarded with a trip like no other.